The new reference in DJ mixers. If you’re looking for a mixer that matches our new industry-standard CDJ-2000 digital decks in power and performance, look no further. Developed with the help of a number of international DJs, this innovative mixer aims for relevance in both functionality and operation to give you total creative freedom. Designed with an integrated system approach to simplify the ever-expanding DJ booth, the DJM-2000 has the effects technology of the EFX-1000 built in. The 6 individual effects processors allow you to create your own unique sounds in conjunction with a stunning industry-first multi-touch panel: a completely new approach to mixing. Also featuring a rotary control and Tap and Trace methods, you get an intuitive layout so you’ll be able to focus on creative mixing at all times. 3 new performance modes including MIDI (with four layouts) make every DJing scenario possible. Enjoy advanced connectivity. ProDJ Link connects up to 4 CDJ-2000s/900s and 2 rekordbox™ laptops together so DJs can easily share their libraries and switch sets. Also, you can quickly sample live recordings, see status information (like live on-air status, channel number and more) on connected decks, and Cue Link lets you listen to rekordbox tracks via a dedicated Cue channel. Connect your laptop and use its audio signal for mixing, too. With the USB four-channel sound card built in (switchable to three-channel at 24-bit), it’s never been easier. The DJM-2000 uses a balanced output amp and its completely discrete structure allows the sound quality in each bandwidth to be adjusted. We pursued the ideal club sound by creating a sound down to the very details of how sound resonates. 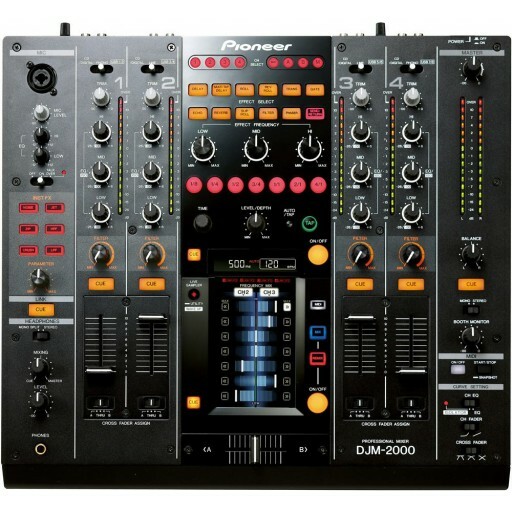 Functionality, connectivity and quality make the DJM-2000 the ultimate club mixer.